The perfect way to add an original splash of color to your event, these handles are an indispensable accessory to have handy at your ribbon cutting. The handles are compatible with our 25 inch ribbon cutting scissors promoting ease in swapping. Scissor blades, screws and bolts are not included with your purchase as they are included with the main pair of scissors. A ready to swap handle for your ceremonial scissors, this accessory is just what you need for adding some visual contrast to your event. The handles are compatible with our 25 inch ribbon cutting scissors. Scissor blades, screws and bolts are not included with your purchase as original scissors will already include all other hardware. They may not do the cutting, but giant scissor handles are just as important to ceremonial ribbon cutting scissors as the blades. The handles serve several purposes, functionally and aesthetically. 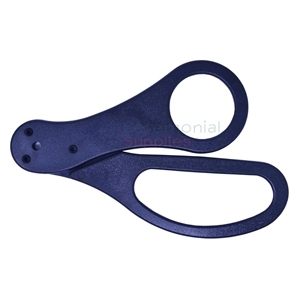 The obvious purpose of the scissor handles is to provide the user with a comfortable grip to use the scissors properly. Proper grip on the handles makes for a more efficient cut, which is why it is so important that giant scissors have a comfortable set of handles. Aesthetically, giant scissor handles are the most eye-catching part of the scissors. The handles are where the scissors are able to showcase colors; often the colors of the company or brand being celebrated in the event. This is ideal because the handle’s colors are usually coordinated with other supplies such as ribbon, balloons and decorations in general. In pictures and in person, colorful giant scissor handles create a visual harmony that is pleasing to look at. Scissors are integral to a ribbon cutting ceremony. After all, without scissors, you wouldn't be able to cut the ribbon. CeremonialSupplies.com understands that aesthetics are important and the photo-op these events bring are a once in a lifetime chance for so many companies. Everything must be perfect, and our main goal is to help you so that it is perfect indeed. We also know that customization and individuality is key. 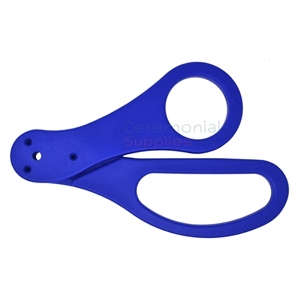 That is why we are happy to offer our customers a variety of giant scissor handles in assortments of vibrant colors to match any brand, logo, or company’s color schemes. In general, scissor handles are most customizable part of the scissors as they also present a blank canvas where you can engrave a special message to commemorate the ribbon cutting. Giant scissor handles may be combined with our golden finish or the stainless steel blades. Replacing or swapping handles is as easy as removing a screw, switching the handles and screwing back on. At CeremonialSupplies.com, all of our ribbon cutting scissors come with customizable handle color options for an experience you can truly own. Combine different colors in one scissor or choose an alternate solid color that makes a bold statement about your company or cause. When it comes to grand openings, personalization is what will make your event a memorable one. Feel free to contact our customer service line with inquiries about giant scissor handles or special requests to customize your look to match your theme colors.